I didn't see where anyone had previously covered the Bull hitch. This hitch is the preferred knot to use when clipping a carabiner onto a loop. I use the Bull hitch when attaching a knife lanyard to a small loop. This morning I went fishing and attached my SAK lanyard to a small loop around my belt, over my pocket, so it would hang cleanly. That 'X' in the line locks the knot tight. And you can see the potential problem here as one loop of the hitch may load up against the weaker gate. It can even lead to the gate being inadvertently opened. Not good if you value your SAK. This really is a superior way to clip a carabiner or snaffle into a loop. Give it a try and see if you agree! Zombie Apprentice Posts: 16,607 I'm not a pessimist, I'm an experienced optimist! I do tend to use the cow hitch a lot, as it's so quick and easy to remove*. When I want something a little more secure, I tend to go for a clove hitch, but the bull hitch looks tidier for lanyard use, as both strands are coming off in the same direction. The figure 8 knot is another favourite of mine, as it can be used as a stopper, loop, or bend. Again though, this bull hitch is tidier on this application. * I often use a lanyard with carabiner as a shopping aid. Feeding it through the handles of the shopping bags and securing both ends with the 'biner, stops then spilling in the boot of the car/taxi, and then with the parcel hook on the back of a knife with scissors, you can lift them all in or out in one go. I tend to cow hitch the knife to the lanyard, and use the biner on a belt loop, but cow hitching to the belt, bull hitching to the 'biner, and clipping that to the knife would work well too. Of course, although my application is somewhat domesticated, you could also do this with a bundle of firewood, shelter poles, or anything else you want to add a quick handle too. I'm a big fan of the figure 8 and it's various (and many) uses. ok I gotta ask, where did you learn all this stuff? and where can i get those manuals/books/what ever it is? I have a small library of books on hiking, climbing, fishing, hunting, canoeing, kayaking, sailing, bush crafting, and....knot-tying...but I'm actually a better 'hands on learner". I've been fascinated by knots ever since my grandfather taught me to tie a square knot, and explained it's importance. I think it was an Army sergeant who taught me the Bull hitch (and the hugely-useful Prusik knot) during a rappelling class. I knew how to tie a bowline, but this sergeant was very particular about how the bowline knot got tied (there are two versions, tail in or tail out; he insisted on tail in, and then sometime added a half-hitch for security). When injury is the possible outcome of a mistake, I really seem to learn well. In a day and age of velcro, zippers, and buckles, few people seem to have much interest in knot-work. However, if you like to play outside, knots still come in handy. In my opinion, it's still worth learning a dozen knots or so. Unfortunately, there are some knots that I've learned, but don't use much. Those are the knots I can't remember the name of or even how to tie sometimes. That is really frustrating for me. 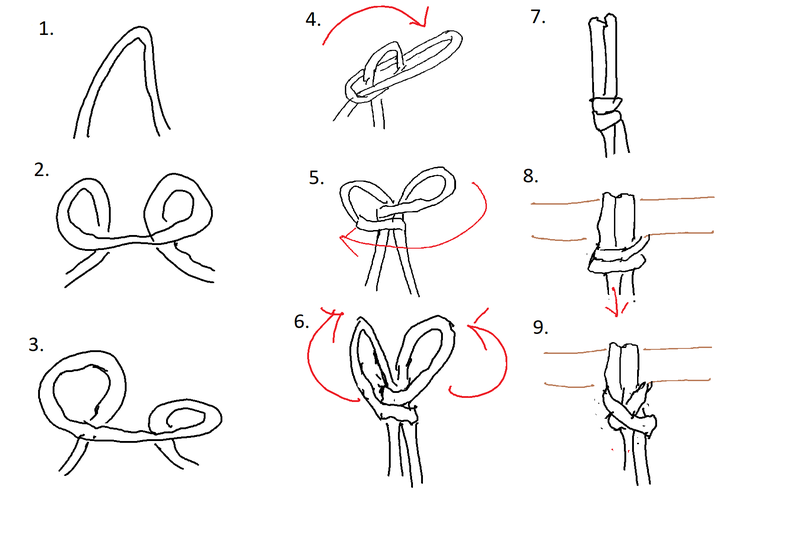 But, if I can, I'll go back to a knot book and re-learn the name and how to tie. Some knots you just can't forget. Like Al's figure-8. That knot is so useful and has so many applications that I find I use it all the time: fig-8 stopper knot, fig-8 tracing knot, fig-8 loop knot, and the related Orvis fishing knot are all variations of the figure-8 knot. I use 'em all frequently. There is no need to learn an entire book of knots. Just learn a dozen that you'll use regularly. It always has helped me to learn why a one knot is more useful than another. That seems to anchor it in my brain better, e.g. the figure 8 stopper knot is superior to the Overhand knot because it forms a larger knot and, more importantly, is much easier to untie after being loaded. The Bull hitch is exactly the opposite. It is harder to untie than the Cow hitch, hence it's value as a knot used to clip into a loop and prevent an accident due to a carabiner mishap (a hard lesson learned from experience, I believe.). Anyway, long answer to your inquiry. What ever you like to do, a knot or two may be helpful. Learn a couple that may be relevant to you. Practice them and try to understand why they work. I find that learning something about the knot (not just how-to), helps me remember it much better. And then I'm more likely to remember to use it correctly, too! Another great knot. I wont remember its name but knowing how to tie it from now on will be one in my small arsenal. 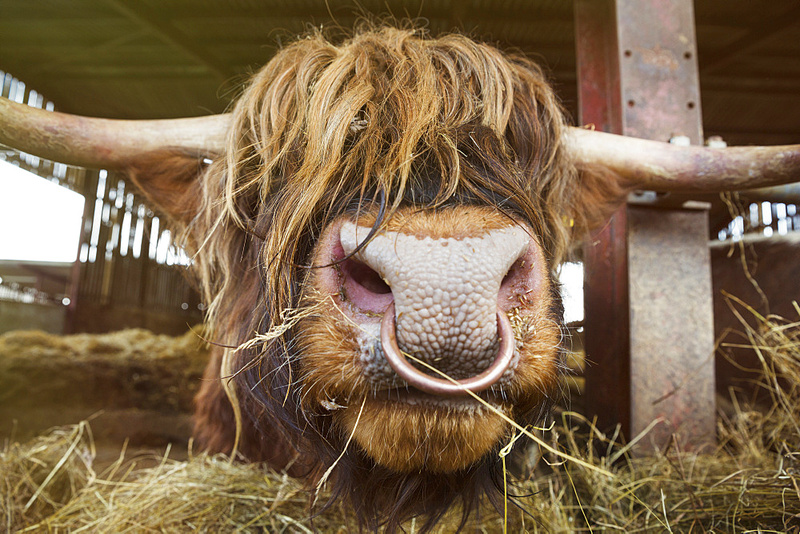 Back in the day (and still) bulls used to have rings in their noses so they could be led around easily. If you were holding a bull by the nose on a rope, would you want that knot coming loose? Ok first off, that bull has a great head of hair. . Great way to create an image I wont soon forget. Here's a twist on the Bull hitch. In the first post, I demo'd how the Bull hitch could be used to add a carabiner or snap to a loop. Here's the same knot, but this time I'm hitching a loop to a post, rail, or branch. Again, the nice feature here is that this knot sort of 'locks' in place and doesn't loosen up as easily as the more straightforward Cow hitch. Keep in mind, the Bull hitch is NOT a permanent knot and can be untied fairly easily. So, just an alternative way to use the Bull hitch. I don't use the Bull hitch this way a lot. Every once in a while I'll use a loop and Bull hitch tied onto a guy line to hang things from. The Bull hitch tends not to slide around the way a Cow hitch might. A Prusik knot might do this even better, but the Bull hitch is a bit easier and quicker to tie. I've also used the Bull hitch to add small loops to tent stakes, another instance where a loose Cow hitch could cause a small issue in the middle of a rainy night. Indeed. My knot repertoire is less than your recommended dozen, but like knots which are versatile (like the fig. 8 ), so I don't have to remember separate stoppers, bends, loops etc. I don't know many knots, but am rarely flummoxed about chucking something functional together when I need to. you continue to impress me with your fountain (or geyser ) of information! Before my time in the military, when I learned a lot of useful knots, I followed the old tradition of "If you can't tie a knot, tie a lot". I can think of several great uses for a knot like this. Before, I would use the cowhitch, and as you mentioned, it can (and will) come loose. Thanks, Ken. Hope it proves useful for you. What I do know is that there is a lot I don't know! And every day I feel a wee bit more ignorant... But this forum seems to be a great spot to share little snippets of information amongst people with similar interests. "If you can't tie a knot, tie a lot"
That phrase raises my heartrate a few BPM. For those who would like to know more knots - there are more than a few good books on knots but I find the best way to be able to use them on-demand when the situation calls for it is (like most things) practice practice practice, and then USE THEM, also get familiar with the different materials, not all knots work (or look) the same with different cordage. If this is a skill you want, it's well within your grasp, don't be lazy. Great alternative Nix to tying that knot. Man << looks for things to tie >> I'm gonna practice both methods, << dogs runs as I reach for his leash >>. I've used a lot of knots but never that one. Now I gotta go find some cord and learn this one. Looks like a right handy knot. Thank you Nix! What? Enablers! Are you serrrrious? Where? I dont see any.